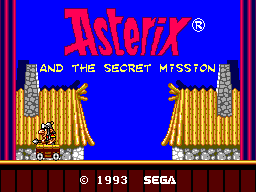 There are three known versions of this game. The PAL and Brazilian versions have similar artwork. 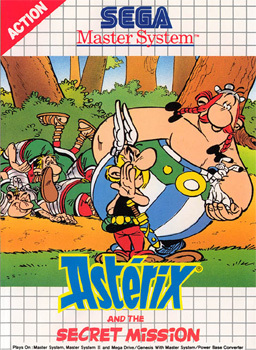 Later in Europe, this game was released in a 'classic' brown-box style. It is slightly more difficult to find than the original, but only differs in the insert. The cartridge and manual are exactly the same. "Getafix the Druid is out of magic potion! If Caesar finds out, it's invasion for sure. 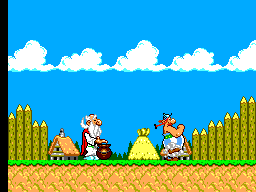 Asterix and Obelix set out to find the necessary herbs. A mission through all sorts of Roman-infested terrain - seas and rivers, forests and deserts, temples and ruins." 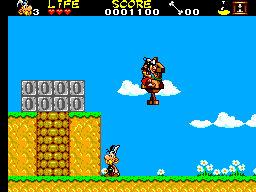 Select Asterix on level five. You'll know you're in the right place if you see snow. You'll eventually come across an extra life on the side of the screen. If you grab it, move just to where it is slightly off-screen, move back and it will be back again. Use this trick to gain up to nine lives.